Young piano students have a lot to remember when learning to read music. Not only do they have to figure out which symbol on the page corresponds to which key on the piano but they also have to remember how long to press and hold each key! It is a real brain workout, and for some, it is very frustrating. This is why it’s a great idea for teachers to frequently separate note and rhythm reading; spending time reinforcing only note reading and taking opportunities to practice only rhythm will give students the tools they need for piano playing success. Today we’re giving you an activity you can use to isolate and practice common rhythms in 4/4 time. 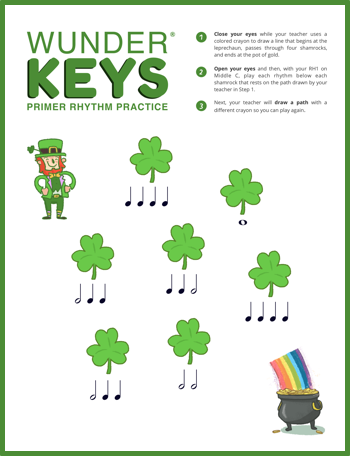 This St. Patrick’s Day-themed game can be used with students in WunderKeys Piano for Preschoolers Book Three or with students in WunderKeys Primer Book One (or with any of your students who could use some extra rhythm reinforcement). To have some rhythm fun, click on the image below to download today’s printable. 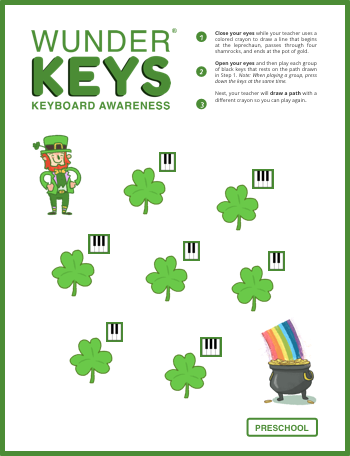 In addition, click on the second image to download a bonus St. Patrick’s Day Keyboard Awareness printable. Love our fresh take on teaching beginning piano? Check out our Primer method book to find out what’s new!